CAPECANAVERAL, Fla. - NASA officials today cleared the space shuttle Discovery toblast off Tuesday as the weather outlook improved for the plannedpredawn launch. Mike Moses,head of Discovery?s mission management team, said the shuttle and its seven-astronautcrew are ready for their 1:36 a.m. EDT (0536 GMT) launch toward theInternational Space Station on Tuesday from a pad here at NASA's Kennedy Space Center. ?We are gofor launch,? Moses told SPACE.com late Sunday. 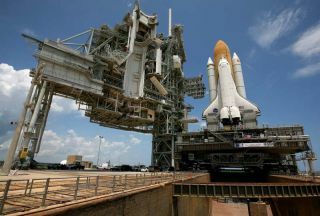 The shuttlenow has an 80 percent chance (up from 70 percent yesterday) for good weather atlaunch time, but only if lightning doesn?t delay fueling operations, saidKathy Winters, NASA?s shuttle weather officer. There is aslight chance that lightning could stall efforts to fuel Discovery?s tank withliquid hydrogen and liquid oxygen propellant late Monday afternoon. A similarweather concern delayedthe launch of the shuttle Endeavour last month. NASA does not fuel shuttletanks if there?s a 20 percent chance of lightning within 5 miles (8 km) of thelaunch pad to avoid the risk of an explosion. NASA coulddelay fueling Discovery?s external tank by up to three hours and still try tolaunch early Tuesday, mission managers said. ?Overall,the weather is looking good,? Winters added. Discovery?ssix-man, one-woman crew is poised to fly a 13-dayresupply mission to the space station. The astronauts are hauling about15,200 pounds (6,894 kg) of new science gear, supplies and spare parts to theorbiting laboratory. Three spacewalks are planned for the mission. The onlyissue facing Tuesday?s launch was a failed power controller on Discovery thatwas replaced last week. An analysis found that a connector in the 30-year-olddevice was bent, causing the failure. NASAengineers are not sure if other power controllers on Discovery may bevulnerable to similar malfunctions, including the replaced one. If they fail inorbit, some systems could be stuck on or off depending on which state they werein at the time of the glitch, but mission managers said there are workaroundsin place to handle those failures. The powercontrollers route power to payload heaters, reaction control thrusters andother systems, so engineers plan to leave them on for the duration of theflight - with the exception of the thrusters - avoid a failure. Multiplefailures would be required to affect all of Discovery?s thrusters, Moses said. Moses saidthat the malfunction will also be reviewed for NASA?s next shuttle launch inNovember.